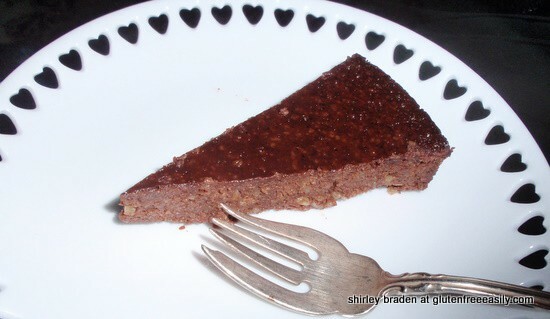 Today I want to share another gluten-free chocolate cake recipe that I love. And another flourless recipe at that. Flourless Chocolate Banana Honey Walnut Cake, to be exact. Loyal gfe readers know that I love flourless recipes. They’re naturally gluten free and always decadently delicious! Recently, I shared my post on the 18 variations of my 3-minute chocolate cake. What’s that? Oh, you only remember 6 variations? Yeah, you’re right … I only shared 6 in that post, but you could easily make 18 variations! LOL I confess I always exaggerate with the number 8 in the mix … it’s one of my little idiosyncrasies. ANYwayyyy … let me get to the important part! Included in that post was a 3-minute, “miniature” version of the flourless chocolate banana honey walnut cake recipe that I’d adapted from my good friend Elana of Elana’s Pantry. All the 3-minute cake versions are quite good, but that particular one is one of my personal favorites (as is Elana’s full-sized original that inspired it) because it exemplifies my feelings about the best type of gluten-free dessert. The best gluten-free dessert in my opinion is one that’s gluten free easily (gfe) because all the ingredients are gluten free in their natural state. The delightful fact about these desserts is that they are the incredible ones that everyone wants to eat; they are not just ones that are safe for gluten-free folks and, well, potentially only minimally edible. I hate it when you get a gluten-free dessert and the assessment is “okay” or “not bad.” Not exactly a ringing endorsement. Instead I’m talking about exquisite flourless chocolate tortes, crème brulee, pots de crème, mousse, flan, flourless cookies, and the like—no deprivation there! Of course, the fact that these desserts are in fact, flourless is a large part of what makes them so decadent. The flavors are shining through in a big way, unencumbered by flour. I promote the flourless (or minimal amount) of gluten-free flour concept here at gfe quite often because for baked goods and many recipes that normally call for flour, adopting this approach makes gluten-free cooking/baking imminently more “doable.” And more importantly it makes the products enjoyable once again. If you’ve been following gfe for a while, you’ve seen recipes like the Flourless Chocolate Cake (a recipe that is quite different from this one but still utterly divine), Mediterranean Chocolate Cake, Flourless Peanut Butter Cookies, Flourless Pizza, and Crustless Quiches. Savory dishes are included because they benefit from no or limited flour for the same reason … you get to taste the essence of the dish more. The other ingredients are front and center, not relegated to second-class status by flour or a crust. Elana’s Flourless Chocolate Banana Cake appealed to me immediately. First, it was flourless … enough said on that point. Second, it called for bananas and I always have some baking bananas in the freezer. Last, it called for honey, and I love to be able to use our bees’ honey. I made a few changes of course. I did not separate eggs as Elana did (I rarely separate eggs—not even for my Flourless Chocolate Cake). I substituted olive oil for the grapeseed oil in the original recipe. I also decided some ground walnuts would add nice texture and provide added nutrition. The resulting Flourless Chocolate Banana Honey Walnut Cake was everything I hoped for. With the always-desired “chocolateness” made richer by the honey and ground walnuts and enhanced by a somewhat subtle banana flavor. One piece of this cake is very satisfying. I took this to a committee meeting one afternoon and shared the rest of it with co-workers the next morning and everyone loved it. Elana did not add flour to this recipe, but I actually think making it with her trademark addition of almond flour (from Honeyville) would make for an equally easy and delicious version of this cake. Until you get some of that, you can make my adaptation below. You probably have the ingredients on hand … because it’s gfe, you know? Speaking of the lovely Elana and her fondness for and great success in using almond flour in recipes, have you heard about her new cookbook? 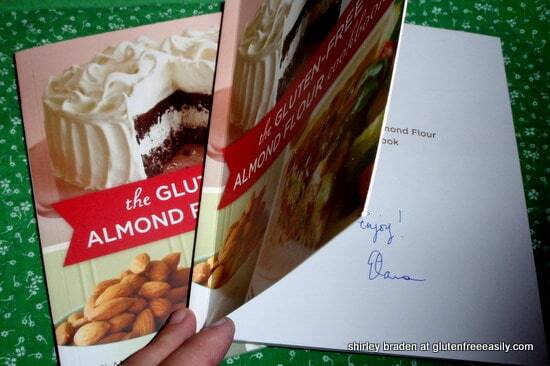 It’s called The Gluten-Free Almond Flour Cookbook. I ordered one for myself shortly after my birthday. Before it had even arrived, I visited a dear friend and she gave me my belated birthday gift … guess what it was? Yep, a copy of Elana’s cookbook. Not a problem at all … because I have decided to give my purchased copy to a lucky gfe reader via a giveaway here! NOTE: This giveaway is now closed. I have that copy with me here in San Francisco at the BlogHer Food 09 conference. Elana is one of the featured speakers. She has also graciously agreed to sign this book for the giveaway when I see her later today. I am so excited on both counts. Because I’m at BlogHer Food, I don’t have a lot of time to share my review, so I’ll give you my brief summary and defer you to a more in-depth review elsewhere, if you don’t mind. This book is as lovely as Elana herself. It includes 99 recipes that run the gamut from appetizers to desserts. Filled with recipes that are delightfully simple when it comes to ingredients and instructions, but wonderfully complex when it comes to flavors and satisfaction. The amazing photos and the little bits about Elana, that are shared in the book, are just frosting on the cake—make that chocolate, creamy coconut, marshmallow or peanut butter frosting, following Elana’s recipes, of course! Oh, by the way, yes, I’m having a fantastic time here in San Francisco! The conference is today! There was a small, intimate kickoff gathering held last night, but today 300 food bloggers will be gathering for a variety of great sessions. Before and after, we’ve been doing our best to take advantage of all there is to see and do. Yesterday afternoon, Diane, Ali, and I went to Muir Woods (a humbling, calming experience of incredible beauty), traveling across the Golden Gate Bridge and also getting to spend some time in Sausolito. We even ran into Elana herself, her husband, and a sibling they’d happened to run into—serendipity. Elana is every bit as lovely and charming in person as she is on her blog. Today I’ve met Stephanie and Alison—both every bit as terrific in person as they are on their sites!—and so many more … “old” favorite bloggers who I’ve been following for some time and new favorite bloggers. We’ve had several amazing naturally gluten-free meals: lunch at Crepe O Chocolat (since closed) and The Slanted Door, and dinner at Farallon. I’ll share more details on all when I return from BlogHer Food! Until then, enjoy this flourless Chocolate Banana Honey Walnut Cake. A rich, flourless cake that is healthy and delicious. Suitable for Passover or any time of year. Add olive oil and mashed banana and blend for another minute or two. Add cocoa powder, cinnamon, and walnuts. Blend just enough so all is mixed well. Grease a 9-inch spring form pan and pour batter into pan. Let cake sit in pan for 10 minutes. Remove from pan and let cool. Cake will be thin and moist. Originally published September 26, 2009; updated April 20, 2019. **Why I’d like to win the cookbook = I’m an avid baker, and LOVE Elana’s recipes, and I’m always looking for new recipes and inspiration. Hi, VeggieGirl–Welcome to gfe! Thanks so much for your kind words … scrumptious is one of my faves, so that’s a high compliment to me! Sorry you couldn’t make the conference. It was excellent in so many ways, with being able to meet my best blogging buddies in person being at the top of the list! Hopefully, you can attend next year. I don’t think any of us who attended this inaugural event will ever want to miss it again! You had me at Chocolate…..
H.Peter–Ha ha, no surprise there! You’ll be happy to know that I am fully indoctrinated in Scharffen Berger now. 🙂 They were one of the sponsors at the BlogHer Food conference. Each participant got a certain amount in their swag bag and then the reps were asking everyone to take home more at the end of Saturday night!!! I took as much as I could without looking too bad. Hey, I’m a food blogger … I might even cook with this stuff. 😉 It’s sooooo good, but, of course, I don’t have to tell you that since you introduced me to it over at The Celiac Husband. Enjoy yourself!! I’m sure the conference will be great =D. 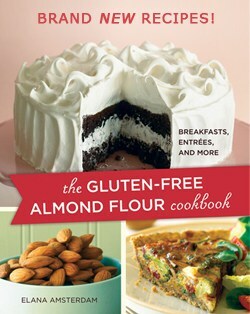 I’d love that cookbook because I adore almonds, and anytime I get to eat them, or add them to my baking is great with me. Also, Elana has such wonderful recipes on her site, so I’m sure the quality in the book is great too =D. Glad Blogher is starting off so well! Have fun! BlogHer Food was the best for sure! Great idea, and it looks really rich and yummy. Who doesn’t always have a ripe banana they need to use up? Even if I buy two bananas a week, I end up with two bananas left over! Now I know what to do with them, besides putting them on cinnamon chex. I would love to win Elana’s cookbook because my husband and son are both GF, my son is also dairyfree. We have been trying to cut way back on the processed sugar we use, so Elana’s recipes are perfect for us! I use the recipes from her blog often, and I would love to have a whole book to experiment with! Hi there, Kassia!–Welcome to gfe! You are right … Elana’s recipes are perfect for you. 🙂 As I was telling someone else, she brought her chocolate chip cookies to the conference and shared. I was one of the lucky few who got to enjoy them—so, so good! Thanks so much for entering the giveaway. It’s really great to be able to share such a terrific and beautiful cookbook with one of the gfe readers! I would love to have the cookbook because I am developing a cookbook library for our celiac support mentor group here in San Diego. When a member asks me for a recipe I will be able to refer her not only to the recipe but also what book it came from. I would love it just because it is gluten free! Hi, Pam!–Love your entry comment—short and sweet, just like Elana’s recipes! Say hi to Anali for me if you see her at the conference. Enjoy SD. San Francisco and the conference were fantastic. Thanks so much for taking the time to comment! I’ve been following your status updates on FB, wanting to know every detail about BlogHer. Yeah, Broncos! Sorry, but I knew you went to the game. It sounds like you had a great time, please do a post on all the fun and games at the conference — and of course, the food. Boy, you are definitely the flourless cake wonder goddess! I can’t believe all your recipes. Oh, and I almost forgot, you do flourless pizzas too, don’t you? What else do you have up your GF sleeve, Shirley? Welcome home — whenever you arrive! Flourless just makes sense for gfe but thanks for your kind words. It’s so nice to have so many other wonderful gf bloggers like yourself and Elana to adapt from and be inspired by. 🙂 I have lots more up my sleeves (flannel pj sleeves right now! ), so stay tuned dear. Oh, and I forgive you for rooting for your home team. 😉 I did feel badly for all those die-hard Raider fans though. It would really stink to get all dressed up like that and then have your team lose. I want the cookbook! I’ve never cooked with almond flour, but it sounds delicious!!! The cake looks delicious. Can’t wait to try. Hi, Hallie–Welcome to gfe! I’ve “seen” you and your great recipes on your own site, Daily Bites, and others in our lovely gf blogging community. Almond flour is a very nice way to bake well and healthily gluten free. Elana is an expert in this area for sure, so her book will be a wonderful addition to your kitchen. Good luck, and thanks so much for commenting and entering the giveaway! I love your flourless cake and couldn’t agree more – cooking gluten-free does not have to be difficult when using products that are naturally gluten free! It’s easier and it is delicious! Thanks so much for participating in Slightly Indulgent Mondays AND for all the kind words, Shirley. You are fabulous. Big hugs. Hi, Amy–You always say the very nicest things—thank you! Estranged from your Google Reader … that’s a nice way to put it. LOL One has to wonder why we are being kept from out beloved internet. 😉 But, you’re being modest … you didn’t mention the reason you were away—the Build a Better Burger contest. Coming in second is awesome—congrats again! Great point on Elana’s recipes being no-fail. She tests her recipes (each and every one!) many times before sharing them on her blog or in print. Anyone who wins will be very lucky indeed! I would love to win this cookbook. I have been gluten free for almost a month now. I am an avid baker and cook and I am just starting out on the gf journey. I would love to win the cookbook because I would love to make simple yet delicious foods for my 2 year old celiac. The almond flour base is really appealing because it addresses her current nutrional difficiencies from the pre-diagnosis damage. Hi, Heidi–Welcome to gfe! Elana’s cookbook does sound like it would be a tremendous help to your family. 🙂 Almond flour is a wonder ingredient. I used it tonight for our casserole entree—so very good! Thanks so much for entering the giveaway … best of luck! I would love to win her cookbook. I was gluten/dairy free for years…and then had kids. I am in the process of switching our whole family to gf, because they will have a happier and healthier mommy!!! And well…they may as well join me. Laura–Hi, and welcome to gfe! A happier and heathier mommy will be a wonderful thing for you and your family. 🙂 Elana’s book would be a big help with so many terrific recipes. I hope you’ll look around here at gfe for recipes to make your transition easier, too. Be sure to check out the gfe’s tip sheets on the sidebar. There are several listings there that will show you main dishes, desserts, etc. that are naturally gluten free or easily made gluten free—gfe. The gfe approach won’t make your family feel deprived because your meals will taste as wonderful as ever. I would love to win Elana’s book because not only am I gluten intolerant, I also have hypoglycemia and protein-rich almond flour is a great way to get the protein I need to keep my sugar level. Hi, Jenny–Welcome to gfe! Yes, Elana’s book would be a tremendous aid to you. Almond flour and the other ingredients Elana uses are helpful to so many and delicious for all. Okay, Shirley — I know you have a “real” life to live, but I’m anxiously awaiting BlogHer details. No pressure, of course, as I barely have time to squeeze in a regular blog post, let alone detail my travels, but I’m so interested in your take on the conference. The food, the people, the knowledge, the fun?! I’ll enjoy it vicariously through you and the rest of the GF gang. Hey Melissa–You are cracking me up … I so easily keep you on pins and needles, perhaps I could become a suspense writer? 😉 Hoping to get something up tomorrow, now that my work week is done. But no promises. Good news, I think my jet lag is finally gone! Yippee! Here’s a link to Elana’s latest post on BlogHer Food with several photos of the gf bloggers, including one of moi. 😉 She did a great job and her feelings mirror my own in many ways. I’ve had my eye on this book! I love to bake, and since I’ve started baking some gluten free things, friends and relatives have expressed interest as well. On a side note, I’m go glad you are enjoying the conference. I’m from the Bay Area and I LOVE Muir Woods. It’s one of my all time favorite places to be. Hi Christina–It’s a great cookbook! I guess you’re looking to win two giveaways in a row, huh? That’s a great way to build a gf cookbook library. I wonder what the odds are of you winning again … best of luck! 🙂 Oh, and it’s wonderful that others are interested in gluten free! You know the saying, be the change you want to see in the world. I got back from the conference very late Monday night. It was a fabulous experience and I plan to share more soon. Muir Woods was amazing. If I lived nearby, I’d visit often. I can see why it’s one of your all-time favorite spots. It’s so beautiful and calming. We didn’t want to leave when it was time to get back on the tour bus. I think we were one of the last groups back. One of the highlights of the conference was making so many friends, and I’m so glad we got to know each other there, and now here! Onto more serious pursuits, your cake looks delicious, I love the pic with the cake and crumbs. I bet that last chunk disappeared in a hurry. I am adding this recipe to my short list! I’m glad you like the photo of the cake. That one I almost didn’t post because it looks so messy, but good cakes are messy, right? That’s how much was left after a committee meeting of five. LOL I took that part to work the next morning and it was gone in a matter of minutes! Why do I want to win Elana’s book. That is easy. Elana fills her blog with her sweet self and her recipes. I have been stocking up on almond flour but could use some more recipes to bake with. Your flourless cake is great. I have made flourless brownies that are out of this world. I had not thought of adding bananas to the chocolate cake, I also have had. Love new ideas. Hi, Chaya!–I love your comment! 🙂 Yes, Elana “fills her blog with her sweet self and her recipes.” And, her blog persona is the real Elana! I hope you’ve recovered from the jet-lag by now and that you enjoyed the rest of your time in SF. How was the football game, btw? As for the recipe, this cake looks amazing! I had a chance to browse through the book at the BH bookstore and its now on my must-get list. Thanks for the recommendation! Now I’m off to find that pizza recipe you were telling me about at lunch. Yay! Hey there, Diva!–Thanks so much for sitting with us! We’re not an exclusive group. 😉 It was such a delight to meet you and others. Some good karma at that conference! Elana’s recipes are really phenomenal. This cake is so full of flavor. All the other recipes of hers that I’ve tried/adapted have always been delicious, too. Thanks for stopping by … welcome to gfe! P.S. Oh, yeah, everyone should try that flourless pizza recipe! I love the chocolate, honey, walnut combination. It sounds delicious! Hi Linda–I added the walnuts to give it some texture and was really glad I did. All the flavors in this cake are in “my favorites” listing. 😉 I find recipes made with honey very satisfying … one piece is just right. I just found your site and am so overjoyed. 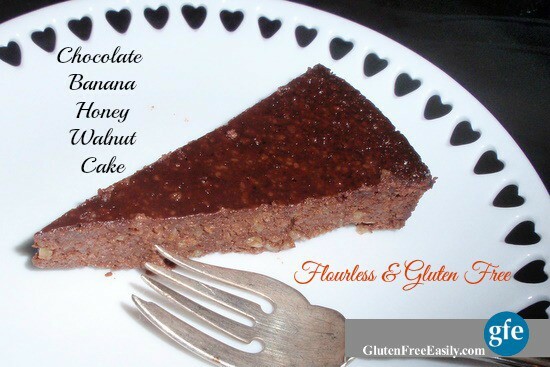 I have hesitated to bake GF but long for something sweet to eat and this Flourless Chocolate Banana Honey Walnut Cake. All the flours make me timid. I am so glad you are here to help me. Thanks so much. Hey, Elizabeth!–Welcome to gfe! Thanks so much for your kind words. I’m glad you found me, too! 🙂 I was like you when I went gf. Finally, I decided making flourless recipes, using my simple gf flour mix, and also cornmeal for baking were all the way to go. On occasion I even use common, but unconventional ingredients for baking–like black beans for brownies or chick peas for chocolate cake. Lately I’ve been using the high quality almond flour that Elana recommends. It all works out well. Look around my site for more flourless and easy baking recipes. 🙂 I look forward to seeing you here more on gfe! I would very much like to win Elana’s cookbook, in order to give it to my 20 year-old son, who is very discouraged about living gluten free. It would show him that he isn’t missing anything, and many new delicious adventures await him! Best of luck and thanks so much for stopping by and entering this giveaway! Oh, I came here to look at recipes and then see a cookbook giveaway as well. First the chocolate cake looks so incredibly scrumptious. I cannot wait to try it- as soon as I can get my hands on some cocoa as I just ran out! I love flourless recipes as well. I am just loving your blog- nice wonderful simple recipes! I would absolutely love to have Elana’s cookbook- I just adore her and her recipes and have never had a one of them fail. I have successfully modified them as well to use various nut and seed flours as we try to keep low salicylate(due to reactions in the kids) and they are still always as wonderful. Having her cookbook would help me so much- as I am constantly running back and forth from the computer to the kitchen while using her recipes as the blasted printer won’t work! It will be put to very, very good use in my house! “I just adore her”–yes, isn’t Elana fabulous? Having just met her in person at BlogHer Food, I have to say she absolutely is! Her recipes are great as written or are easily adapted as you said (and as I’ve also experienced). LOL on the run from kitchen to printer … I’m the one who goes from kitchen to computer with scrap piece of paper (for jotting down recipe) and back to kitchen. (My printer is downstairs.) A real cookbook sure can come in handy, huh? Thanks so much for commenting and entering the giveaway! oh my goodness how i’ve wanted elana’s cookbook! it is on my wish list, but how fun to win it?! lovely cake also; bananas, walnuts, and chocolate are clearly one of the best combinations, ever. I just got Elana’s book from the library and love it! I would love to own a copy. I also just launched a website with gluten free and dairy free recipes…www.KendraLay.com. Hi, Kendra–Welcome to gfe! Since you’ve already checked out Elana’s cookbook from the library, you know exactly what a wonderful prize you would be winning. 🙂 And, bravo for your library for already having a copy, since it hasn’t been out that long–very cool. Okay, you’re entered in the giveaway! I just checked out your site–congrats on launching it! I know what a momentous occasion that can be from my own experience. I’ve subscribed and will be following you … some really good stuff there … recipes, acupuncture, foot massage (I wanted one immediately after seeing that photo with the post), and more. All the best and best of luck in the giveaway! Thank you for the shout out. We had so much fun making the recipes from Elana’s cookbook. They really tasted great too. My family keeps asking me for more. Your chocolate cake looks great too. I’m going to have to give it a try too but with no bananas. The only thing I like in my chocolate is more chocolate. I also had a great time in San Francisco at BlogHer Food and touring around town with you and Ali. What a great town to eat gluten free. So many great options out there without even being advertised as gluten free. Love all the comments you have going here. I hope whoever wins this cookbook gets busy cooking right away. Oh, yes, that was such a wonderful time with you gals! As long as we were out on our own, we had no problems with eating gluten free. And, you echo a point I am always making … that a restaurant doesn’t have to have a gluten-free label or menu per se to be a wonderful choice for eating gluten free! too bad i missed the giveaway, but Elana’s book is something Im definitely going to get for myself and for my friends. And this flourless cake is just amazing!I’d love to bring over our readers to your site if you wont mind, just add this little foodista widget to this post and it’s all set to go, Thanks! I’m not familiar with Foodista. Thanks for the invitation … I’ll certainly check out the site! Thank you for introducing me to Slightly Indulgent Mondays. Found you through Elana’s Pantry. This looks GREAT! Can’t wait to try it… Thanks! Hi Marillyn–Welcome to gfe! Thanks so much! This is a lovely grain-free cake. I hope you’ll enjoy it. 🙂 Please let us know what you think or if you make any adjustments. There are some really lovely desserts in that roundup, aren’t there? My Elvis would love this. Thank you for sharing it on Friday Foodie Fix. Hello there! Thanks for this wonderful recipe! i was wondering if I could do it without the bananas…would it work? Could I maybe use another fruit? Thanks again! walnut cake, how much would you add?